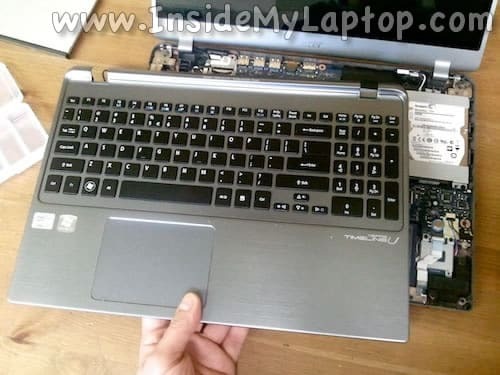 Before taking it apart, make sure the laptop is turned off. 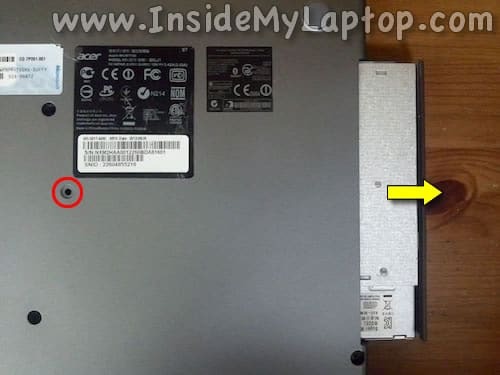 Pull the optical drive to the right and remove it. Remove fifteen screws from the bottom. 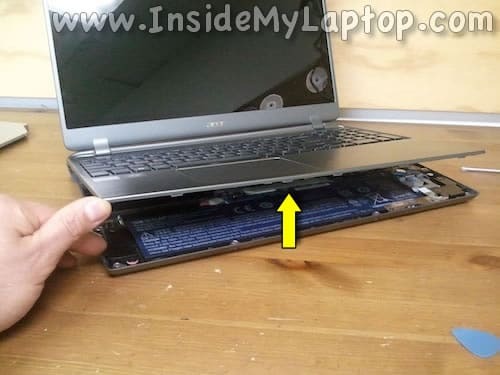 Start separating the top cover assembly from the bottom of the laptop. I am using a guitar pick to separate the top from the bottom. Continue removing the top cover. Be careful when you lift it up. 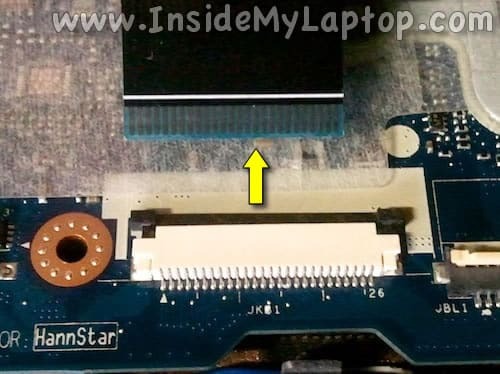 There are three cables connecting the top cover to the motherboard. I will explain how to disconnect these cables in steps 9-13. Carefully move the top cover away from the display. Now we can access and disconnect one cable located on the left side from the display connector. Carefully unplug the cable. Do not pull by the wires. Remove white tape securing the top cover cables. Let’s release the keyboard backlight and trackpad cables. Lift up the white cable retainer with your fingernail. The retainer will open up at a a 90 degree angle. Now you can pull both cables from the connectors. Let’s unlock the keyboard connector. Slide the cable retainer about 2-3 millimeters to the shown direction. Do not separate the retainer from the connector base. 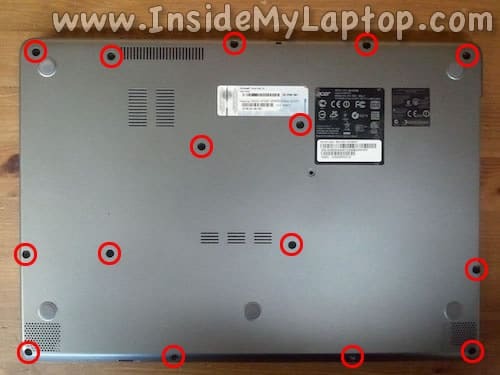 Remove the top cover assembly from the laptop. 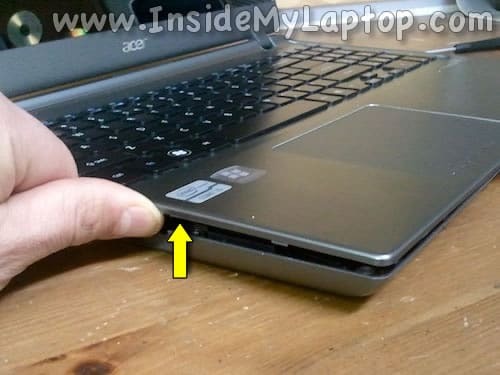 In Acer Aspire M5 the keyboard is attached to the top cover. 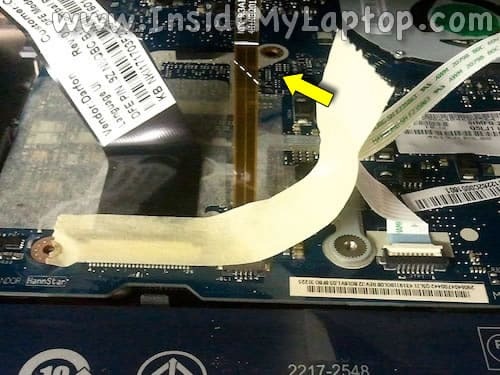 In order to remove the keyboard you’ll have to remove the black mylar tape and unscrew the keyboard. When the top assembly removed you can access the internal components. Disconnect the battery before working with internal components. Lift up the hard drive assembly from the case and turn it 180 degrees. It’s easier to disconnect the hard drive cable this way. The DC power jack mounted close to the left hinge. 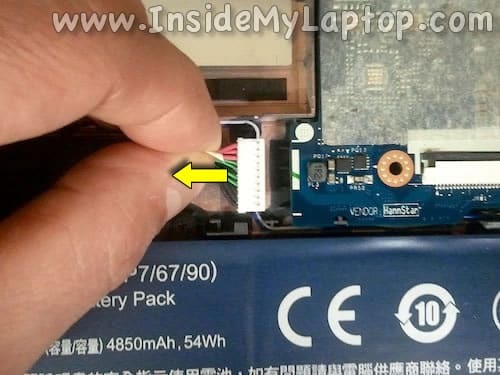 The jack is not soldered to the motherboard, it’s attached to a cable. Hi there. I have exactly the same model M5-581T-6490, it has power problem. I think the jack is going bad. I have to move adapter connector to charge the battery. Thanks for instructions. Do you know where I can buy the jack? I would test the adapter first. Do you have a voltmeter? Make sure the voltage is correct. You can find this jack on ebay. I just searched and found a few listings in there. They cost about $10-15. Good luck! Do you know where CMOS battery is? Yeah I know, look at the step 20. You can see the CMOS battery in the lower left corner, between two connectors. It’s soldered to the motherboard. Hello, thank you very much for the guide! I was searching for it because my M5’s gpu’s fan is making a slight grinding noise, and was curious if you knew anything about that. Thanks. If the fan started making noise you’ll have to replace it. New fans are available on ebay for about $15. I haven’t tried replacing the fan myself but I believe you’ll have to remove the motherboard for that. 2) The power adapter is real loose. What do you recommend I replace? just the base cover or should I get the whole motherboard and base? Probably I wouldn’t replace the whole motherboard just because of damaged DC jack. I believe you can find a USB audio adapter and use it instead of on-board jack. Maybe it’s not very convenient and bit but it’s cheap. I guess you’ll have to remove the top cover and take a closer look at the jack. That’s the only way to figure out what is wrong. Maybe you’ll have to replace just the jack which is very easy. Also, if the base is broken, I guess you can secure the jack with epoxy or something else. Hi Tech, and thanks for your guide. 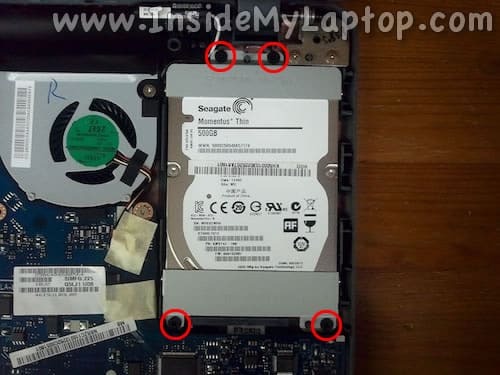 My trackpad recently stopped working and i was wondering if there is a way to change it for another one. 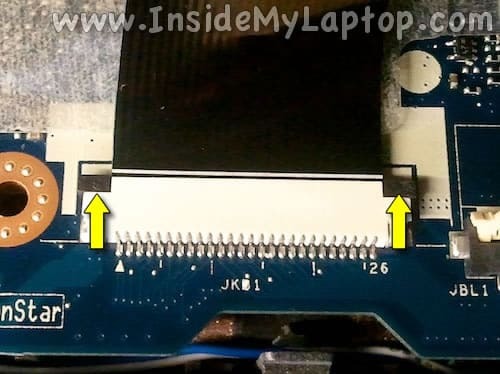 You can replace the touchpad after you remove the top cover as is shown in the step 15. 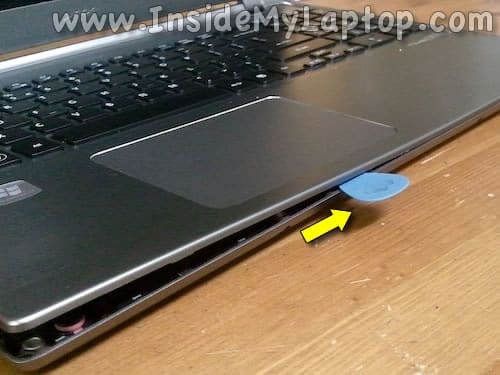 Remove the metal bracket securing the touchpad and after then you should be able to remove the touchpad. Alternatively, you can replace the whole top cover assembly (palm rest, keyboard, touchpad). I think you can find one on ebay for about $60. It started out with weeks of the screen glitching when I had it open at certain spots. This sounds like a possible display cable issue. 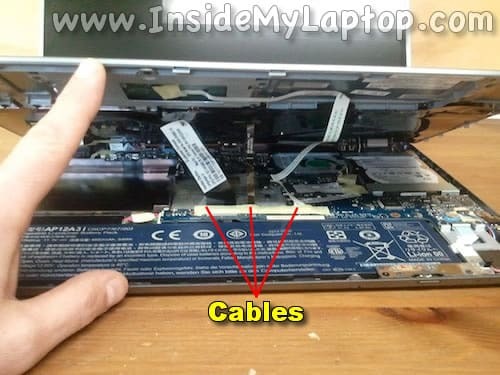 It’s possible there is a short inside the cable. But I”m not sure how it’s related to the battery. 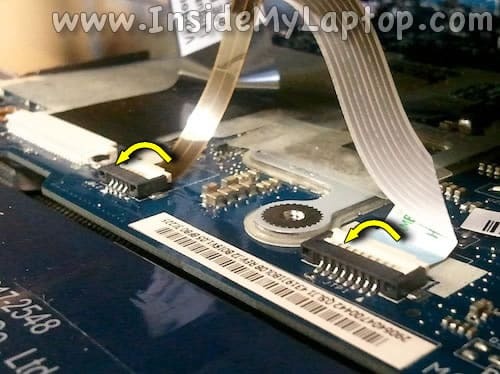 You can try disconnecting the display cable from the motherboard and see if the battery will start working after that. If it fixes the battery issue, I guess you’ll have to replace the display cable. I have a same laptop and want to replace my wireless card. Can you tell me where it is located? Not sure about that. I don’t see the wireless card on the visible side of the motherboard. It’s possible the Wi-Fi card located on the other side. Try to find antenna cables running from the display assembly and follow them. The reason for needing to disassemble mine was due to intermittent power failures after some sort of impact. I took a look inside nothing looked suspicious, after reconnecting all the cables, I tried powering up the computer off the battery, it didn’t. I reconnected the power adapter, pressed the power button, it worked. 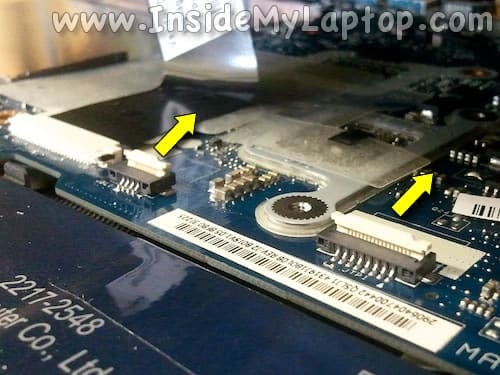 Apparently, because of the ultrabook’s battery design, the battery cable that connects to the motherboard does not fully ground the battery; the screws do. Somewhere in the Internet I read that one of the screws near the Power and Charging Indicator LED did the grounding and that if you pressed around the area, the battery would start charging again. 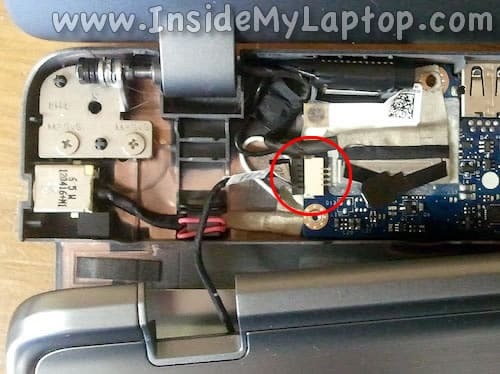 Another forum suggested to press the battery reconnect button from underneath the laptop with a paper clip. I did not try pressing the button to get mine to charge again. 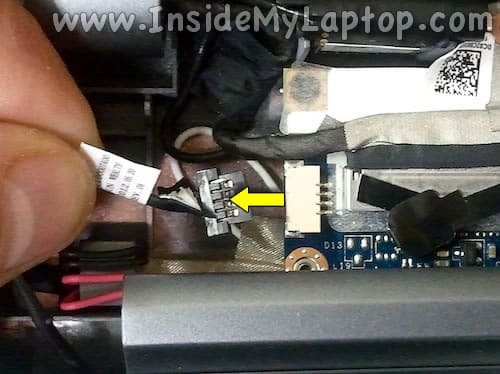 I simply reconnected every cable, made sure the masking tape that holds down the keyboard, backlight, and touchpad cable didnt cover up the screw hole from the inside. This might potentially cause grounding problems. I threaded all the screws, tightened them all with a precision screwdriver until it stopped, and did a quarter of a turn more. Be careful not to over tighten. Reconnected the power adapter and immediately saw the charging LED come on. Powered up the ultrabook, and tapped it from the sides with my hand, shaked it a bit, no problems after that. Still stays on no matter if I bump into it or if I set it down on the table. I just replaced the hard drive on this computer to a solid state (cloned the drive). When I tried to power it back on , it didnt work. For some reason I connected the power adapter and its working. It will only work if I have the AC adapter plugged in. If i try to run it only using the battery , it will not work. I never had any problems with the battery before. 1. I pressed the button on the bottom to reconnect the battery – didn’t work. 4. Then I plugged in the battery with the power adapter , it booted. When I click on the battery icon, it says, 77% batter (plugged in, not charging). 5. I tried to power it on with just the battery, it will not power up. Jeff, the same just happened to me. Try what jerry suggested but no luck. I push the battery button under the notebook and, well, things got worse! After pushing the button I couldn’t power on the nb even with the power cord plugged. I open the case again; unplugged & plugged the battery and I could power it on with the cord on. Finally I tried a BIOS “Load Deafults” as I read it on other forum… voilà! Battery came to life. On the other hand, it’s a fact that the battery is grounded by the screw. Hope it helps. Have you disassemble an Aspire M5 583P? The case is a bit different. I would appreciate if someone can give me some instructions to remove the keyboard. Hi there. I have exactly the same model M5-581T-6490, it has keyboard problem. I don’t know where is the problem. In the first time, my problem was with the battery, but the problem is solved. After, the keyboard has met a big problem. Indeed, only five or six keyboards key was run. Now, the problem is only with my keyboard. Should i to buy a new keyboard ? One year with this laptop and now i’m very tired because I haven’t solutions about this problem…Thank you so much for your help. Hi, is it possible to upgrade RAM. How do I get to the fan to clean it? Remove the cover as it shown in the step 16 and blow off the fan with an air compressor or canned air. -holding down power button with battery disconnected. -resetting the battery through the rear pin hole. -turning on with only power adapter-no luck. Everything looked normal when I disassembled it. Only thing I found remarkable is one of the screws that hold down the sink was not tight so i tightened it. At this time, I cannot get the laptop to turn on. When it is plugged in, the charging indicator lights up to either amber or blue depending on how much juice is in the battery. Any help would be greatly appreciated. I’m thinking either the motherboard or the 20gb SSD has failed. And BTW, the wifi card is located on the bottom side of the motherboard in the top left corner near the power plug. from what I have read, depending on model, these come maxxed out at 6gb. Before I decided to take mine to a repair shop, I decided to see if maybe the power button was the issue. All is well now. $4 fix. 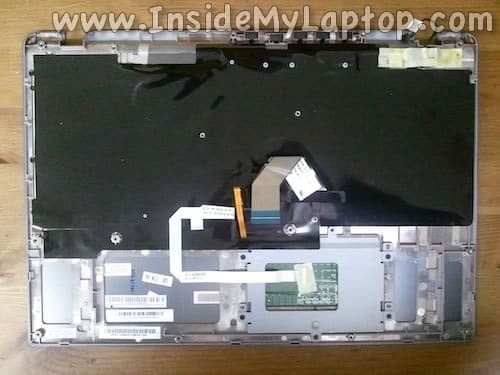 I wanted to replace the keyboard of my Acer Aspire M5 481T but after removing the top part with the keyboard i am a little scared to pull of the mylar tape as you describe in step 15. do I need to replace the tape or will I be able to stick it back on when the keyboard is replaced? please I have aspire m5 -481pt, with charging problem ,my battery icon showing 1% plug in not charging, with charger connected the laptop is working but not charging. please advise me on what to do. I had my m5 for around 9months and when opening the lid I would get fuzzy horizontal lines on the screen. After a year one day I opened the lid then the screen went black and it turned off. Ever since then it says no battery is detected and the screen does not work. I have to keep the ac plugged in and connected to an external monitor to use it. Any suggestions to fix it dyi. Hello, mistakenly I actually disconnected the keyboard retainer,and it stopped working as it only detects some keys such as (A, and S) does that mean I wont get my keyboard to work every again? 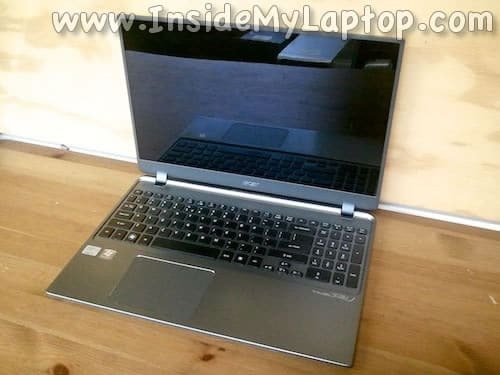 I have an Acer Aspire M5 – 583P. After six months of use my battery stop charging, it will only work if I have the AC adapter plugged in. If i try to run it only using the battery , it will not work. My keyboard has also a problem, 6 keys stoped working including the F2 so i cant activate the BIOS. I have no clue on what to do. Hi! Thank you very much for post this information. 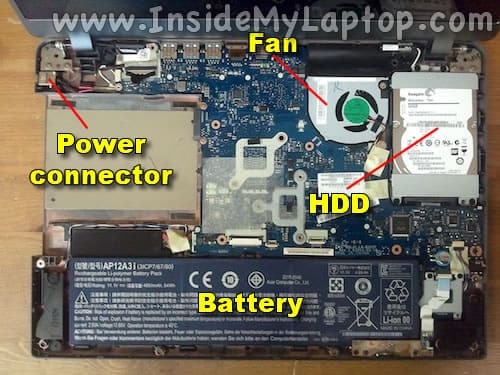 Where is located the CMOS Battery in this laptop? 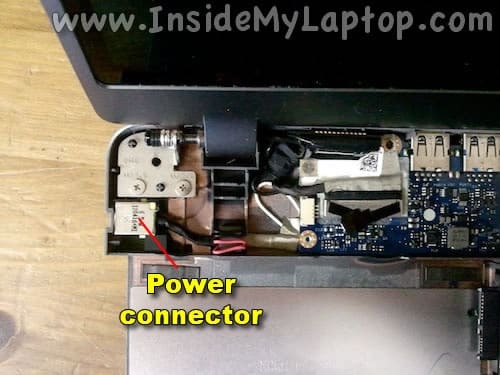 I have the same computer, in step 16 what is the component unter the power connector but above the battery called? I forgot my password to get into my acer aspire m5. I know I can remove the cmos battery to reset the password. If I remove the bottom cover is the cmos battery right there on the board?